What can I say... I was in the car A LOT today. Ana to school and back. Ana to dance and back. Zoe to dance and back. To the pharmacy. To drop off Girl Scout cookie money. We were definitely on the move today. It's not too bad a view though. 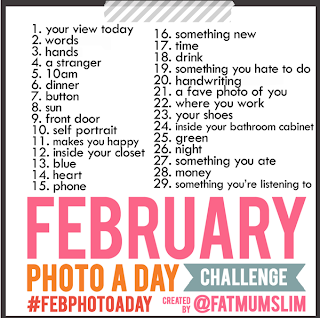 I've decided to take part in the February Photo a Day challenge that was created by Chantelle of Fat Mum Slim. I'm #563 on her link list... so there are a LOT of photos to look at each day if you're interested. The challenge rules are pretty simple. Photo prompts are provided. Some seem pretty straight forward while others are vague. All are open to however you like to interpret. You take a pic any way you want. You post it anywhere you want. There is a link list to sign up on. And, if you share on Twitter or Instagram you should use the hashtag #FebPhotoADay. Yes... simple. Unless you're me. I'm making it difficult on myself. And probably confusing for you to follow. I am including a disclaimer right here from the beginning. We are going on a trip later this month for Winter Break. There is every likelyhood I won't have access to post at A Madison Mom. But... I'm hoping I'll at least be able to take a shot a day and get it posted somewhere. I'm going to take all of my #FebPhotoADay pics with my iPhone with Instagram. (If you're on Instagram and want to connect there I'm amadisonmom) I can post to Tumblr from Instagram (and I do) so you could follow me there. And, if I can get my iPhone blogger app to work... maybe I'll be able to post here. Instagram. Tumblr. A Madison Mom. It'll be a surprise. My #FebPhotoADay could just pop up anywhere. Want to join in too? You can keep it simple. No need to complicate things like I am.